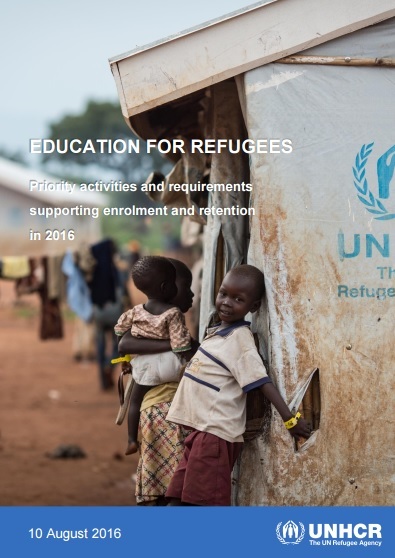 Focusing on 16 countries in Africa, Asia and the Middle East – which collectively host 2.1 million refugee children of school-age (5-17 years), an estimated 57 per cent of whom are out of school – this document highlights targeted activities and requirements that could enable tens of thousands of refugee children to enrol in school during the upcoming academic year. These activities also seek to support retention of currently enrolled students; redress classroom over-crowding and a lack of qualified teachers; provide critical learning materials; and generally contribute to a safe and protective learning environment for all students. In some instances, especially where refugees are living in host communities, these activities will enhance the learning experience of host community students as well. This information is drawn from UNHCR’s 2016 budget, as presented in the 2016-2017 Global Appeal and subsequent supplemental appeals approved by the Executive Committee. The requirements outlined correspond to existing unfunded needs for activities which UNHCR could reasonably implement by the end of this year. Individual chapters provide an overview of the refugee and education context in each of the 16 countries, followed by a description of critical challenges and proposed activities. The table that follows specifies remaining funding requirements for planned activities, providing relevant performance indicators, comparably 2015 year-end results (where applicable), and output targets for the activities by year-end 2016.